@edmaul69 Why should this lead to a lag problem? Never heard of this before. There are some games with cd audio music included, in example Rayman and Battle Arena Toshinden (wonderful soundtracks btw). @thelostsoul well depending on the power of the system it’s possible that running a game like wipeout that runs that fast there may be hicccups that you wouldnt see in games like rayman. Rayman is a 2d game that doesnt have the background changing as fast as wipeout does. None of us knows why some games arent included so we are all speculating at this point. @edmaul69 Ok fair enough. :-) It could be possible. But don't forget, the games aren't on disk anymore. Now you remember me when I started with PSX emulation on RP3 and had some problems with cd audio games, exactly like you describe. There was small hiccups in example at Ridge Racer. While I agree on your other statements, this statement is the one I don't much like. I read this often. While it is not untrue, there is something else you get for your money with the official systems: The work has been done, no need for configuration, setting up emulator, games and the whole RetroPie sytem, no need for "piracy" (or at least don't feel bad for it) and internet connection to get the games and so on. It is pre configured for plug and play. Said that, I won't buy it, because I am happy with what I have. But I can fully understand if someone is getting it, even if it is not perfect. It is the only official plug and play retro PlayStation release yet. i don't know if it has been modified (if it has they will have to release the source code as per the GPL), but to get accurate bare-bones psx emulation for these titles you likely wouldn't need to. looking at the screenshots, the UI doesn't seem very interesting either, compared to what nintendo did for the NES/SNES classics. i think we'll see a lot of knock-offs on ebay, using retropie and delivering a better experience (NTSC versions of the games, better UI, higher resolution, shaders and so on). i do agree with @thelostsoul on the benefits of official products, though. The comments on that kotaku article, make me want to put my fist through the monitor and give them all a good slap. I mean, I started out a few months ago not knowing NOTHING about the Pi or Linux, and yet here I am today able to make my own retropie image from scratch, as well as tweak settings, mess with the config, overclock, setup perfect CRT resolutions. I've even read comments that say "Yeah, you stick with your pirate emulator and roms", and I'm thinking YOU would be using the same emulator that most retropi owners are using, so who is the pirate now ? Idiots. And are Sony going to be sticking the the gpl ? And the GUI is god-awful. It's like Sony gave the task to some young intern, along with Windows Paint, and internet access. I might buy one just to gut it, and stick a Pi in there. looking at the screenshots, the UI doesn't seem very interesting either, compared to what nintendo did for the NES/SNES classics. 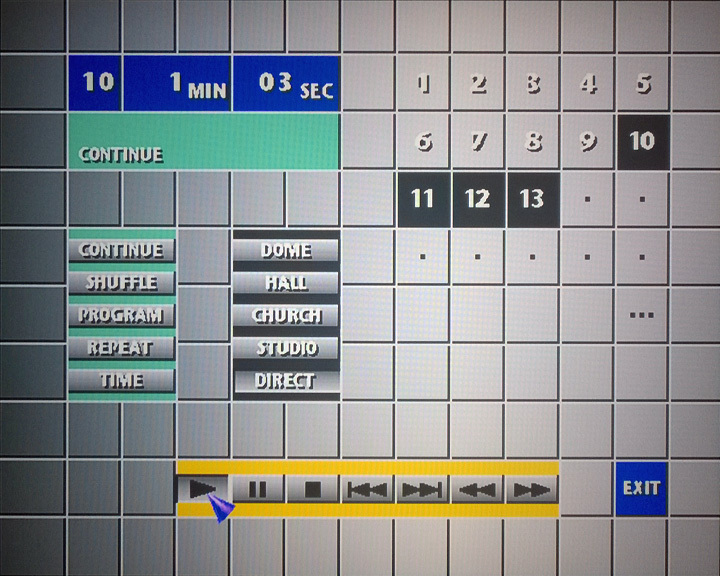 Well, they're emulating the look of the original PSX options menu. The problem is, that design always looked like it was thrown together quickly without any thought. At the time, I was learning Macromedia Shockwave and this design was very close to the most basic user interface examples from the book I was using. At a certain point nostalgia should be tempered with good taste when releasing a modern commercial product. apparently UK had a different BIOS to USA (and maybe some of europe?) weird!! i never knew! the grey functional look always seemed in-keeping with the PSX as a piece of grey industrial looking hardware, from a company i was more familiar with for making hifis! Neither did I. I definitely prefer the UI you guys got. Ours looks like there was a mandate to be edgy with the design, just so long as it was completed during an unpaid coffee break. @mediamogul so reading kotakus revue there is an image of gta. Some of the building walls lines are wavy. I know in spiderman this was a problem with the emulator. Is that the same case with this game and on this classic system? The Playstation didn't have a Z-buffer, so couldn't do perspective correction. Thats why most 3D games had that weird wobble effect as you moved. Perhaps the second pic is using Beetle PSX emulation with PGXP on ? -Texture Warping. PS1 lacked a lot of texturing ability such as perspective correction. Easily seen when looking at a "straight" line on a texture that wasn't straight. Floors are the perfect place to see this. Driving games suffer a lot from this. -Polygon Jitter. PS1 didn't have subpixel rasterization, which means the vertices were "snapped" to the pixel grid. The Nintendo DS suffers the same problem and has the exact same artifact. Easily seen in a static scene with a mesh that is "breathing" or animating slowly. Check out the NDS remakes of FF3 and FF4 during cutscenes. PS1 didn't have a Z-buffer, but it wasn't the primary cause of the two above artifacts. Crash Bandicoot 2 and 3 implemented software Z-buffers in special areas, but the games still suffers from the two above issues. Some of the building walls lines are wavy. I know in spiderman this was a problem with the emulator. Is that the same case with this game and on this classic system? I have both those games installed, but even though I love the original Playstation, I don't find myself emulating it as much as other systems for whatever reason. It's also been so long since I've booted up my original machine that I'm not even sure if I've ever picked up on this issue before. It's very interesting to see the perspective correction information @John_RM_70 and @thelostsoul posted. In fact, the list is pretty good in my opinion. There is almost everything, Destruction Derby, Final Fantasy 7, Rayman, GTA, Resident Evil and such classics. I think this list is better than the SNES Mini has. I don't know what drove me there or if i have a split personality, but the list is everything else than good!! Don't believe me over there. I rethink about the games and there are too many important games missing. You can't release a Playstation Classic without these missing games. The final release would so much benefit from 10 more games of the list below and would save Sony some embarrassment. Let me not start talking about the emulator itself and features. @thelostsoul Nice list of games. Sony is delivering a complete mess of a system. Missing lots of classic games, no menu music, no dual shock controller (especially for Metal Gear Solid) and no graphics options. Most of these games (if not all) will look quite horrible without scanlines/smoothing. They couldn't even be bothered to use an inhouse emulator. It all looks extremely lazy to me and I feel sorry for everyone buying this. It's a licensing issue. As big as Sony are, they probably can't get a license for the music tracks. Games like the Wipeout series, and Gran Turismo, had commercial music in them. So my guess is that, it's either they can't get a license, or the cost of getting one - per-track, not per-game, is not worth the cost because Sony would have to add that cost to the mini PSX. @John_RM_70 I am sure there was some licensing issues. Gran Turismo 2 also had 500 licenses real cars. At least the first GT had not that much. Whatever the reason is why these games aren't included, it does not make the situation better. Ok, say Sony could not get the license or worse, it was not worth it for them. The games will be still missing. Missing lots of classic games, no menu music, no dual shock controller (especially for Metal Gear Solid) and no graphics options. I found most of these deficiencies online, except for the missing menu music. Where did you learn about that?